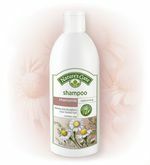 Our Chamomile Shampoo nourishes weakened color-treated hair to support the vibrancy of color and highlights while improving texture. Hair is replenished by the nutrient-rich oils and proteins from our blend of 7 Healthy Hair Nutrients. Fortifying and soothing botanicals including Chamomile and Horsetail make this shampoo gentle enough for everyday use. Water, Cocamidopropyl Hydroxysultaine (Coconut Derived), Sodium Cocoyl Isethionate (Coconut Derived), Disodium Cocoamphodiacetate (Coconut Derived), Lauryl Glucoside (Vegetable Derived), Glycerin (Vegetable Derived), Chamomilla Recutita (Matricaria) Flower Extract, Panthenol, Hydrolyzed Soy Protein, Hydrolyzed Vegetable Protein, Simmondsia Chinensis (Jojoba) Seed Oil, Borago Officinalis (Borage) Seed Oil, Tocopherol (Vitamin E), Ascorbic Acid (Vitamin C), Hordeum Vulgare (Barley) Extract, Rosmarinus Officinalis (Rosemary) Leaf Extract, Equisetum Arvense (Horsetail) Leaf Extract, Geranium Maculatum Extract, Salvia Officinalis (Sage) Leaf Extract, Ascorbyl Palmitate (Vitamin C), Polysorbate 20 (Vegetable Derived), Leuconostoc/Radish Root Ferment Filtrate, Hydroxypropyl Methylcellulose (Plant Derived), Sodium Hydroxide, Phenoxyethanol, Glyceryl Undecylenate (Vegetable Derived), Citric Acid (Vegetable Derived), Fragrance*.